On deck this week: Cornell’s Johnson School of Management campus building Sage Hall. 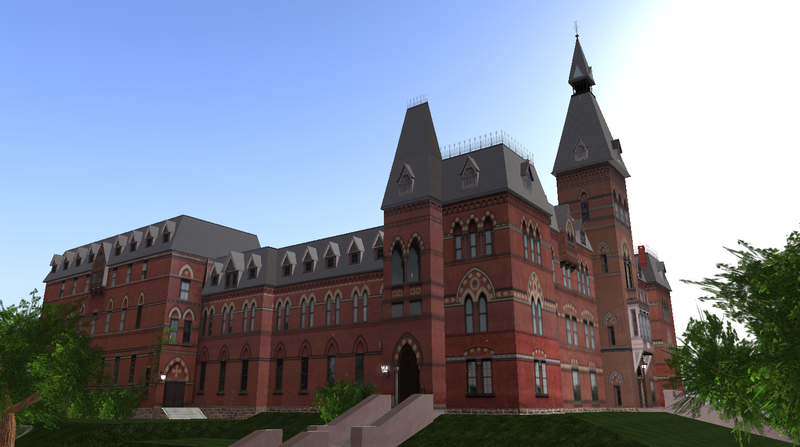 I am happy to say that Sage Hall Build for the Metanomics Island sim is on time for delivery. 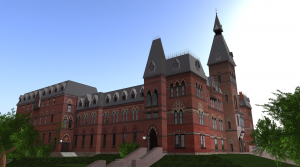 Here are some pictures taken at random during the updating of the mammoth 19th century brick building for use as a location in the virtual world in which Metanomics with Beyers Sellers is hosted weekly. 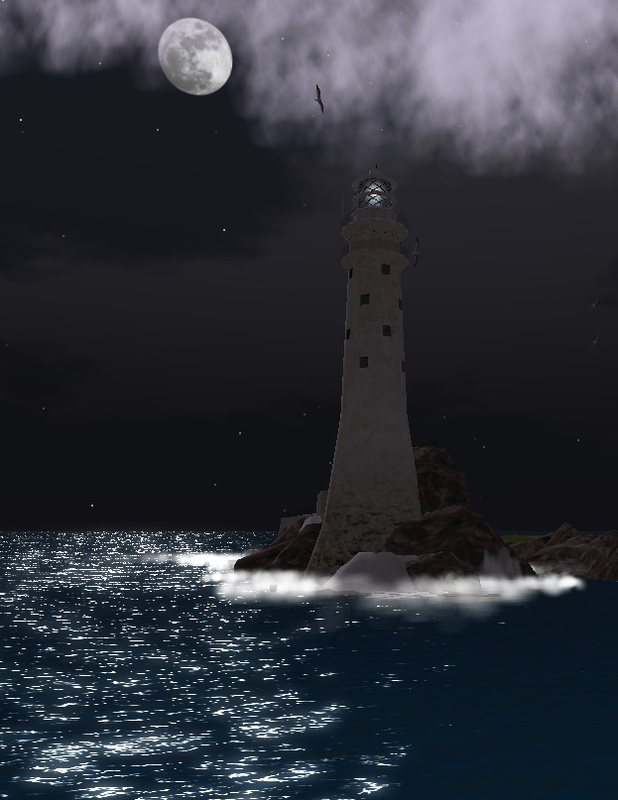 Metanomics is owned by Remedy Communications, and operated at the Muse Isle Connection Region of Islands in Second Life. 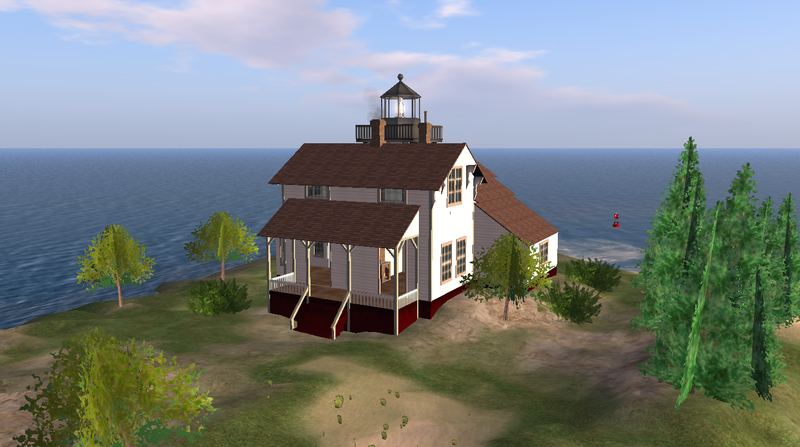 Just around the corner is the Muse Isle Landmark Lighthouse Kiosk – and just recently, JenzZa Misfit of Muse Isle has offered me a coveted vendor space for Kiku*Craft at Muse Isle West, a gallery of shops, sports, artistry, and fun! Fastnet has a wonderfully rich history. The light itself is memorialized as “The Tear of Ireland” for it is the last thing you see when travelling by ship west toward America. It has been an example of technological innovation in lighthouse design, and will be remembered for its role as the far mark in the Fastnet Race, a legendary test of sailing and seamanship leaving Cowes and returning. The 1979 Race was marked with tragedy as a storm approached 20 people died during the event. The details of the race and its impact on ocean racing was documented in many fine texts, including “Fastnet: Force 10” by John Rousmaniere.